Spoilers included for The Flash. With twenty-four hours left to save Iris, Barry will do whatever it takes to save her, even breaking into ARGUS to find a power source for the speed bazooka. But in order to pull off such a heist, he needs help, so he travels back in time to recruit Captain Cold. The return of Captain Cold, even if it's a past version, is the highlight of this episode. His sass is still strong, and I love that he can crack the world's greatest security lock in 37 seconds. And the fact that he stopped Killer Shark because he was bored and watched Shark Week was hilarious. I mean, literally if Team Flash would have done research about sharks they could have stopped Killer Shark a lot easier. His morally gray taunting of Barry to leave him behind is fantastic, and it plays well with the Legends of Tomorrow timeline as Snart would soon be sacrificing himself for his friends. I'm glad he was back for an episode, but I wish they were bringing him back for real this time. Please come back, please don't be dead. You can't go wrong with a creepy CGI shark-man and Jaws references, right? Killer Shark was an interesting twist to the episode, reminding us what ARGUS has stored in their base but also providing a tricky guard dog (or guard fish?) to defeat. The special effects were cool, especially the fin rising from the cold mist and Killer Shark growing back a limb. It was a nice touch. I also enjoyed the name-dropping and Suicide Squad references that were made in in the ARGUS facility. Once again, we see what else ARGUS has hiding in its base and reminds us that the world of the CW superhero shows is bigger than we think. Cisco was a gem in this episode (as always), and his commentary lightened up the darker mood. I love his dialogue so much. And while I'm worried about him, I'm glad he's going to confront Caitlin and hopefully show her how much he and the others care about her. Go, Cisco! Go! I felt like this episode was a waste because Lyla refused to give them the Dominator tech, but then they break in and she hands it over because she doesn't want to see Iris die? I didn't understand it. 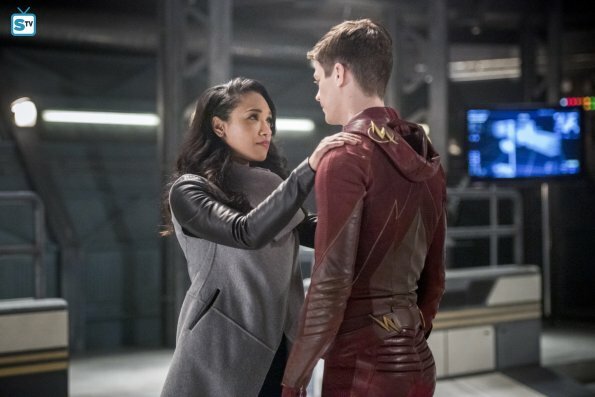 Why didn't Barry just tell her what Savitar is doing or could potentially do if he isn't stopped? He could destroy the world, but Barry doesn't mention Savitar, just that Iris will die. It was too easy. I don't know why they couldn't just hand over the power source from the beginning if they were just going to do it anyways? Or better yet: why not hide Iris in ARGUS, which is apparently the most secure facility on the planet and where Savitar cannot use his abilities? Seriously. The logic of this show sometimes. By the end of the episode, the entirely of Team Flash is broken, and it is not fun. HR blames himself because Savitar tricked him. Wally feels inadequate because he couldn't stop Savitar. Tracy feels like a failure because her gun didn't work. (Though, why didn't it work?) Where the frick-frack is Julian even at? They never explained his absence. And Cisco is currently locked in a death match with his best friend, which is terrible. But the worst? Barry. He just stood there. He didn't try to save Iris until Savitar started in for the kill. He tried to plead with him, but obviously we knew that wouldn't work because he'd already tried it. It was garbage. All of it. I am, however, pleasantly surprised that they did kill Iris. Shocker, I know. I can't believe they did it. I think they'll find a way to fix it by the end of the season, but I'm impressed they didn't let Team Flash magically stop Savitar. It was a nice twist. Honestly, the whole beginning and end and how it came together was the worst. The episode started off sad with this depressing song, and I knew it wasn't going to end well. But the ending with Iris' message being played while Barry ran toward Savitar and Savitar killed her and everything was actually worse than I was expecting. It's on the same level as the season two ending of BBC's Robin Hood, especially with the wedding vows. Why did you kill all my feelings, Flash? Why? As much as I love seeing Captain Cold back, I felt like this episode suffered from illogical decisions. Team Flash is a group of super-geniuses and you're telling me that they can't think of a better solution to keeping Iris safe? They didn't even use all their resources (hello, other dimensions) or make a plan to stop Savitar in the off chance the speed bazooka didn't work. Still, the episode pulled at my heartstrings and left me anticipating the season finale to find out what Barry will do next. Seriously, though, where was Julian?! What did you think of "Infantino Street"? Are you surprised by the turn of events? React with me in the comments!